How excitement! Just in time for your Valentine Day preparations SU have released a fabulous special. You will receive a FREE package of Heart Treat Cups–a $6.50 value–when you purchase the Sweetheart Stamp Set or Full Heart Punch. Yes! 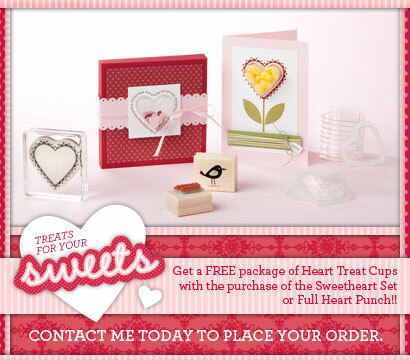 if you purchase both the stamp set and the heart punch you receive TWO packets of the heart treat cups. Bargain! But note………..this special only last until January 24th 2011. So be quick.